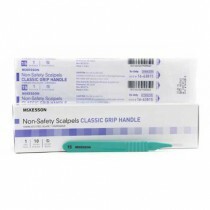 Scalpels are small and extremely sharp bladed Medical Instruments used for surgery or anatomical dissection. They are foundation instruments of any surgeons tool-set. A “surgical scalpel” and a “medical scalpel” are the same things. Sometimes they may be referred to as a “surgeon's scalpel.” They may be single-use, disposable or re-usable. 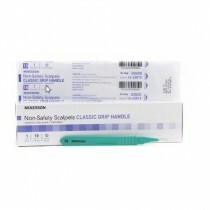 Most disposable scalpels are designed for single-use. 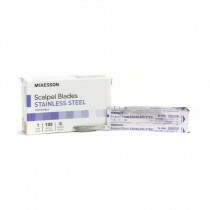 Scalpel blades are usually individually packed in sterile pouches. 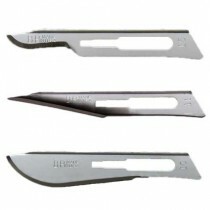 Some manufactures also offer non-sterile scalpel blades. The handles are often made to be reusable whereas each blade is used only once and then disposed of for sanitary purposes. 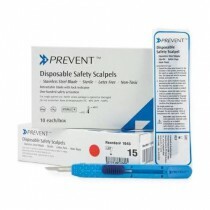 Disposable Scalpels usually have a handle that is made of cheaper material such as plastic. That way the entire scalpel can be disposed of after use. Scalpels usually consist of two separate parts. The handle or holder is a fixed and reusable part of this surgical instrument. It fits snuggly into the palm of the hand and fingers. It usually is textured f to provide a sure grip even when wet. Sometimes a measuring scale is also provided as shown in the graphic below. There are two types of handles--a flat handle and a pen-shaped handle. The other part of the scalpel is the blade. It is sharp and disposable. It is used once and discarded to prevent transferring pathogens. The blades are easily replaced on the handle. 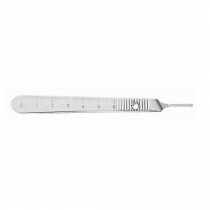 Used in medical procedures, these surgical instruments are very common in hospital and clinical settings. 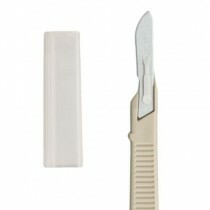 The scalpel handle is usually made with a composite plastic while the scalpel blade can be made of carbon or stainless steel. 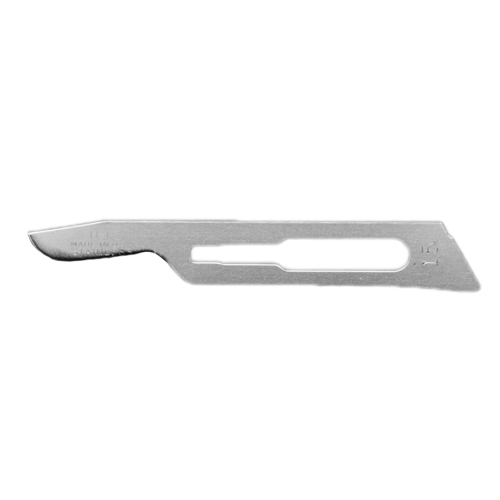 As metal blades wouldn't be safe for use in an MRI monitored surgery, ceramic blades, diamond, and obsidian blades would be used alternatively. The handles vary as well. Some are flat and thin, while others are more rounded like a pen. 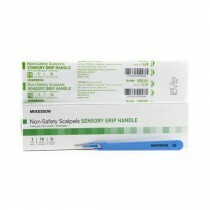 It is important for a hospital to have plenty of the correct scalpels and other tools available to them. Depending on the type of surgery and the needs of the surgeon one procedure alone may require several different types of scalpels and other instruments. Manufacturers for these medical instruments include Ansell, Aspen Surgical, Dynarex, McKesson, Miltex, Robbins Instruments, and Swann-Morton. 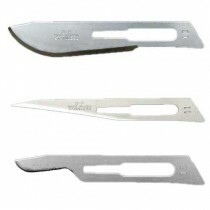 Common blade sizes and types of scalpels are designated by a number. 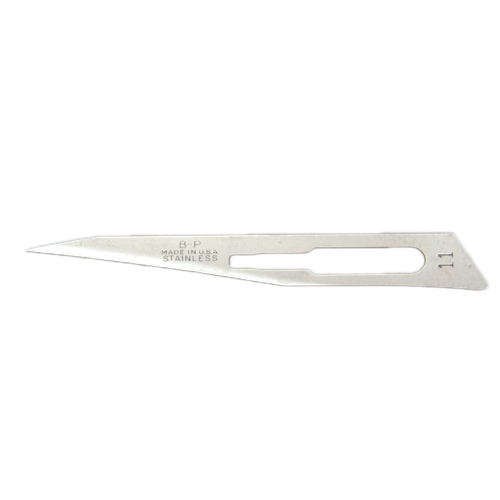 For instance, the #10 scalpel offers a curved blade with an unsharpened, straight back edge. 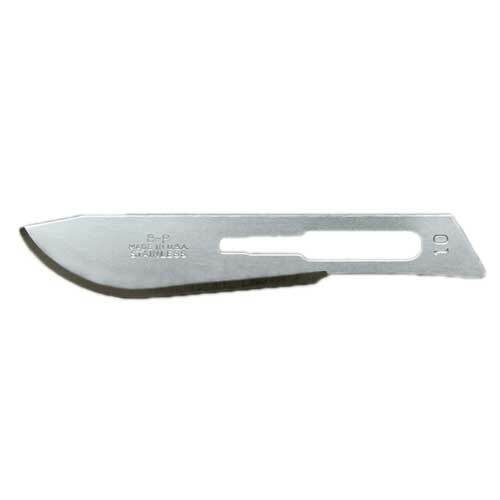 Number 11 Triangular blades with flat edges are useful for stripping and cutting sharp angles. 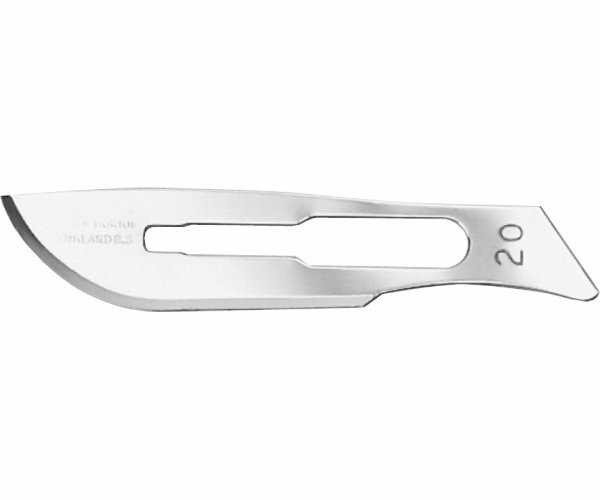 Number 20 curved blades are designed for general surgery. 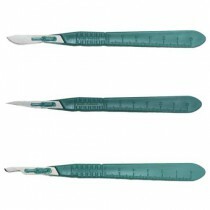 Number 23 scalpels are long and leaf-shaped and are designed for particularly long incisions. 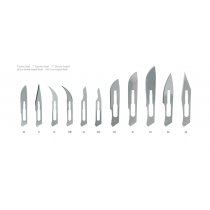 Below is a chart displaying the most common scalpels and a brief description. New surgical instruments with safety devices have been developed to help protect surgeons from accidental cuts and injuries. These instruments have a plastic-like sheath that covers the blade until the blade is ready to be used. 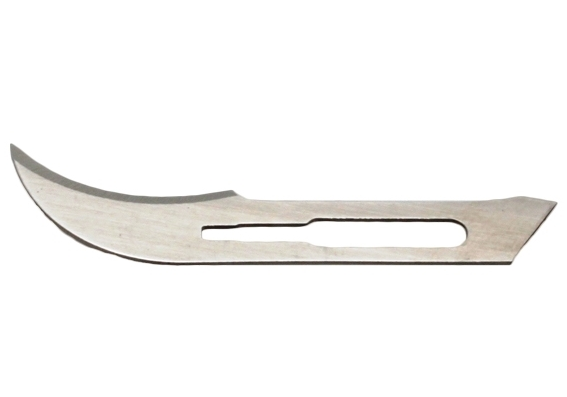 The safety flips up or pulls off to expose the blade when it is ready for use.